^ a b c d Hoffman, R; Al'Absi, M (December 2010). 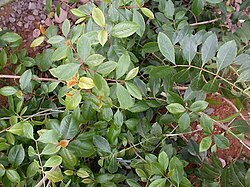 “Khat use and neurobehavioral functions: suggestions for future studies.” (PDF). Journal of Ethnopharmacology 132 (3): 554–63. doi:10.1016/j.jep.2010.05.033. PMC: 2976806. PMID 20553832. http://www.ncbi.nlm.nih.gov/pmc/articles/PMC2976806/pdf/nihms220028.pdf.